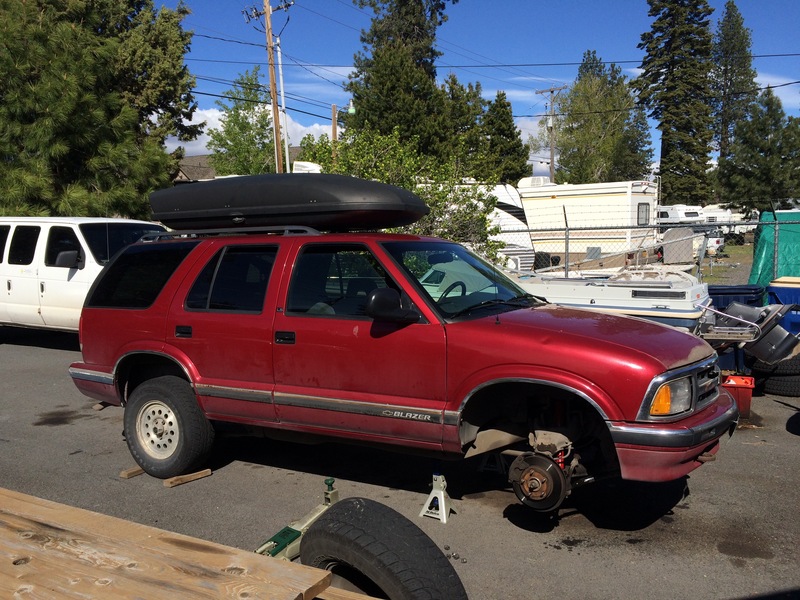 Hey everyone, I've been lurking around the forums for a while now after getting my 96 Blazer LS last summer. I've been reading through a bunch of the build threads and looking up fixes and decided to start my own build thread to kind of keep track of my progress and kick around ideas. One of the first things I knew I needed to work on is the front end. 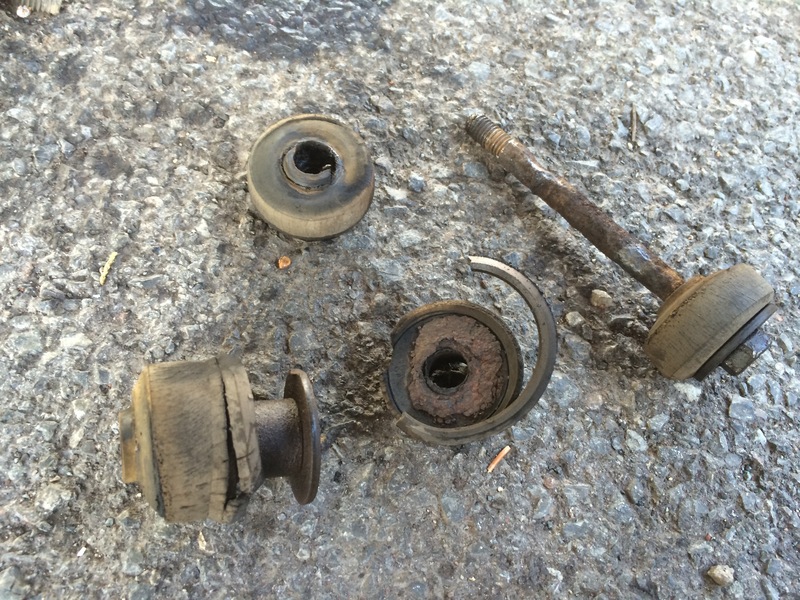 All of my tie rods, pitman arm, idler arm, ball joints, etc need replacing. 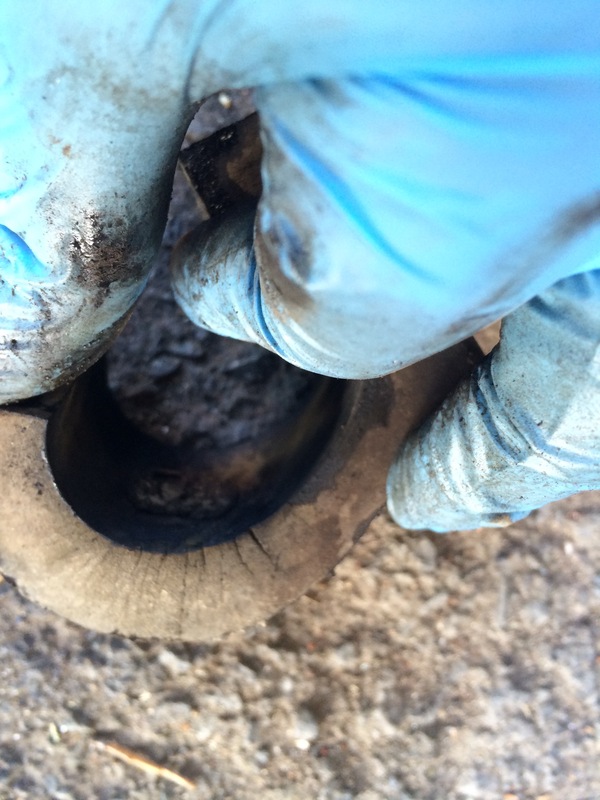 I also found that my sway bar bushings were toast and my shocks were still the original stock shocks. After a good 256K miles on her I figured new shocks would help the wobble. I didn't take any pictures of my shock replacement that I did a couple of weeks ago. 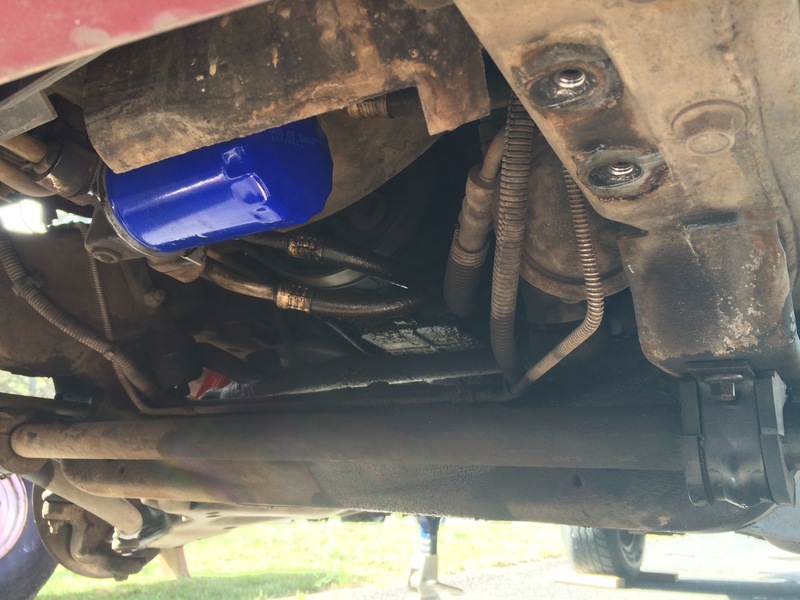 This past weekend however I replaced my sway bar bushings and end links and figured I would take pictures as I went. Jacked her up and removed both front wheels. Old end links. Sprayed with PB to get them loosened up a bit. Removed the plastic skid plate and found where my oil leak is. Seems to be a fairly common problem in these beasts. I'll be looking into a fix for that soon. 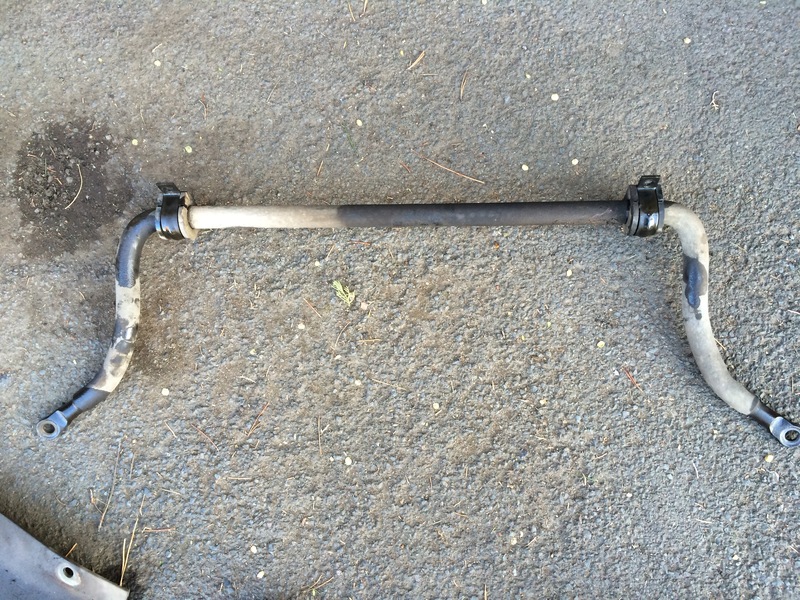 End links were pretty bad, the sway bar bushings weren't horrible, but cracking none the less. All prettied up. Started painting it red to (mostly) match the body color and the red Gabriel shocks I put it, then ran out of paint half way through. Decided I didn't want to waste time and money going to the store so I found a fresh can of paint in the garage.. Didn't get a picture of the final install since it was after dark by the time I got it all back together but it all looks good and the ride is much nicer now. Left my skid plate off for the time being, didn't see any reason it needs to go back on just yet unless anyone else knows of a good reason? Welcome to the forum. 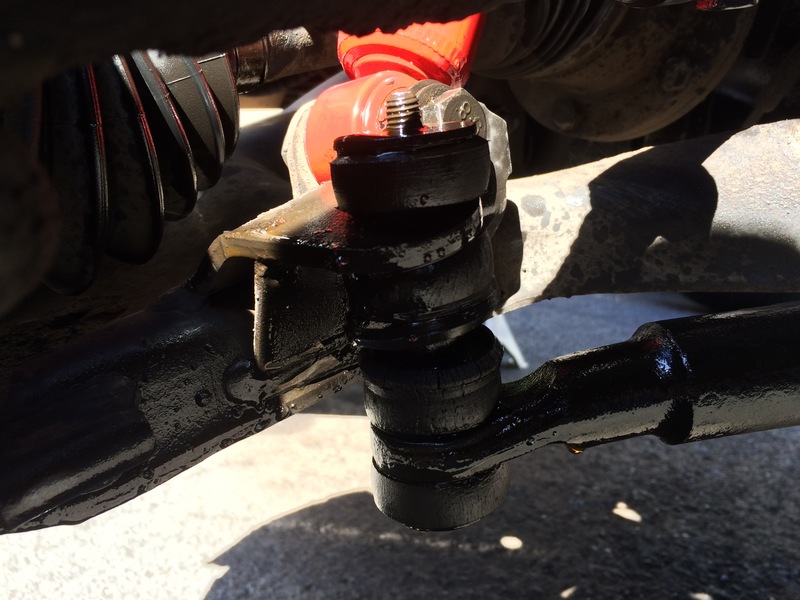 Sway bar bushings and end links are a very common and easy to fix issue on these. The same with those oil cooler lines. Is that sway bar purple or blue? It's purple. Not even sure why I had it, but it was better than nothing and I couldn't leave it out any longer since this is my daily driver. Thanks Rex, I just recently finished reading your entire build thread. Great work on your truck! I liked your manual solution for the tcase, luckily mine came with the manual floor shifter so I don't have to bother. Quick Reply: Learning as I go..